The U.S. dollar has weakened significantly driving many of the major currencies to the highest level in months. 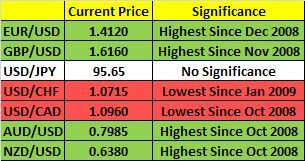 Here’s a table illustrating the significance of today’s moves. I expect at least another 2 percent decline in the U.S. dollar against the key currencies (Short and Long Term Outlook for U.S. Dollar). The fact that USD/JPY is not participating in today’s rally indicates that investors’ distaste for dollars rather than their risk appetite is driving the dollar lower. The modest gains in Dow futures and the sharp rise in gold prices confirm that investors are bailing out of dollars. In my interview with Fox Business 2 days ago, I talked about how the one takeaway from the concern about the credit worthiness of the U.S. is the need for diversification. Yesterday, a Brazilian official said that the BRIC nations (Brazil, Russia, India and China) could take unilateral action to reduce their dependency of dollars at their summit next month. Brazil has already begun to replace the dollar bilaterally in their trade with China and unfortunately this trend could continue with other nations following suit in the coming weeks and months. The one thing that the financial crisis has taught investors large and small is need for diversification and no one wants to sit with baskets full of dollars waiting for S&P to make an announcement. Sovereign Wealth Funds are taking this to heart which could create a fresh supply of dollars. ← USD/JPY: What is Behind this Power Move?